William McGregor Paxton and Elizabeth Vaughan Okie (1877–1971) met when they were students at the Cowles Art School in Boston. 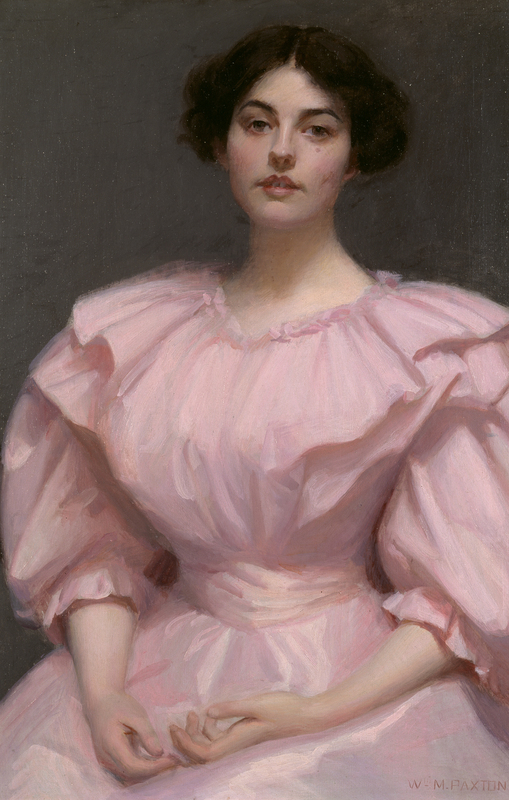 Thinking they would bond, their mutual teacher, Joseph R. DeCamp (1858-1923), introduced them. According to family lore, it was love at first sight. Paxton and Okie were engaged in 1896 and married three years later. Over the next several decades, they both became successful artists, William best known as an accomplished portrait painter and Elizabeth as a painter of still-lifes and interiors. Elizabeth was also one of her husband’s favorite models and appears in a number of his masterworks. The Athenæum's portrait is the earliest image of her by William Paxton and may have been painted specifically for her. With its vibrant colors and loose handling of paint, it is a good example of the rather free, Impressionist style in which Paxton worked in his early years, before he turned to a more hard-edged, linear style. Most of Paxton’s early paintings were destroyed in a studio fire in the first decade of the twentieth century, making this a rare survivor from that period of his professional life.